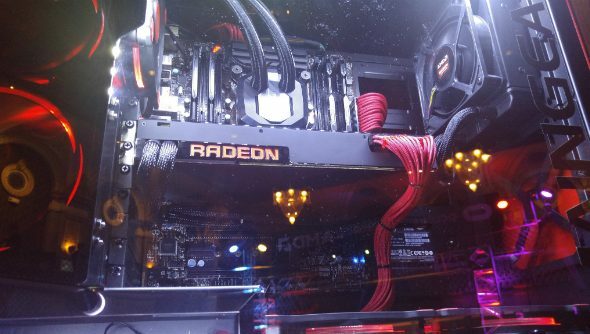 AMD updated their GPU roadmap this week to forecast the arrival of their 14nm Polaris 10 chipsets later this year. Need to see which games are coming that you might want an upgrade for? Here are the best upcoming games for PC. The roadmap, previously shown at the company’s Capsaicin showcase at last month’s Game Developers Conference, pits the long-rumoured Polaris 10 chips against a 2016 release window. The Polaris architecture will contain fourth gen graphics cores, as well as support for HDMI 2.0 and Display Port 1.3. The resultant Radeon 400 series should see massive improvements over the 300 and Fury series which have failed to challenge the Nvidia 960/970/980 range’s 82% market share (2015 Q2) in a meaningful way. In an earnings call this week, AMD also revealed that the second quarter earnings had been boosted by commitments to provide three System-On-Chip (SOC) solutions for the gaming market. It’s likely these chips are related to console gaming revelations such as the next semi-generation of PlayStation 4 and the Nintendo NX. However CEO Lisa Su also revealed that the Polaris GPUs would be rolling out in the “second half of 2016”, giving rise to an extra earnings bump in the traditionally profitable third quarter. Following on from Polaris, AMD has announced that the Vega and Navi architectures (probably not named after prominent CIS eSports organisations) will feature High Bandwidth Memory 2 and NextGen Memory respectively. Nvidia’s upcoming GTX 1080 has been confirmed not to feature HBM2, so the GPU market gap may be narrowing by the end of this year.